This n' That LunchBots Bento, a photo by sherimiya ♥ on Flickr. 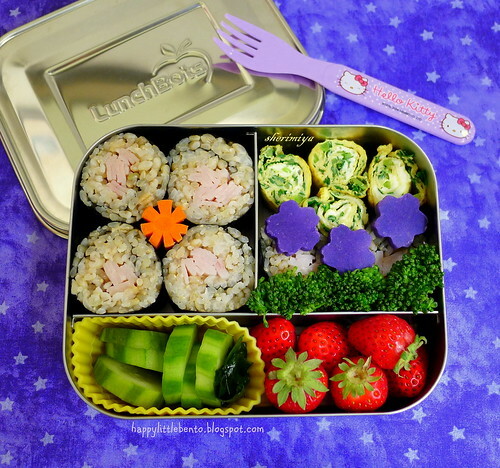 For TinySprite's last bento of the week, I used the LunchBots Trio and packed some makizushi (with brown rice, barley and ham), tamagoyaki with spinach and broccoli stems, carrot, broccoli, steamed Moloka'i Okinawan sweet potato, pickled cucumbers and wakame, and baby sweet strawberries. Simple, fresh and tasty for my girl. Her brother MisterMan comes home tomorrow, and we can't wait! So pretty! Finger foods, really perfect lunch here. I love how you mix carbs with protein and fruits/veggies. Your kids are so lucky!